Does Nissan Even Care About Motorsports In North America Anymore? Nissan’s North American motorsport efforts in 2016 were marked by a renewed focus on production cars: vehicles like the GT-R that they could point to and say, “We sell that!” Problem is, Nissan’s factory effort in Pirelli World Challenge, called Always Evolving, will be losing their factory support for 2017, according to a Nissan employee whose comments were seen by Jalopnik. And it may not bode well for the brand’s other racing endeavors. Nissan has been spending big bucks on Star Wars: Rogue One and Heisman Trophy tie-ins lately, but not motorsports, suggesting a shift in priorities for the brand. Enthusiasts aren’t ultimately the ones with control over how Nissan’s North American arm spends its dough. The Always Evolving team will still receive limited support along with all of Nissan’s other customer teams. Additionally, Nissan will continue to provide some support to club racers—which is more than many marques do, but is not as comprehensive a program as Mazda’s, for example. The withdrawal of Nissan’s last true factory effort in the United States makes us wonder: does the same brand that dressed up their Altimas as race cars in ads just a couple years ago still care about motorsports here at all? To understand how and why we’re so confused by what Nissan’s doing with its motorsport efforts now, you have to consider their recent history. Last March, Jalopnik sat down with Nissan North America’s Motorsport Manager Rick Kulach to catch up on what the company was up to at the beginning of the year at the Pirelli World Challenge round at Circuit of the Americas. At the time, the marque had just abruptly shuttered its top-class Le Mans prototype program after never quite figuring out how to make it work, firing much of its Indianapolis-based staff via email mere days before Christmas. Its previous high-profile partnership with the DeltaWing was still mired in a nasty legal battle that wasn’t settled until later in the year. It’s not hard to understand why another LMP1-class or experimental Le Mans prototype wasn’t at the top of Nissan’s wish list in 2016. Kulach confirmed that the LMP1 program—which was primarily a European effort despite being run out of Indianapolis—hadn’t provided the return on its investment the brand had hoped for, hence the decision to shut it down. Nissan was having great success as an engine provider for the LMP2- and LMP3-class prototypes and with production-based race cars, so the brand pared-down its expenditures on motorsport in 2016 to focus on doing those things really, really well. Nissan’s innovative GT Academy program, which gives Gran Turismo gamers the chance to become pro racers, had also been cut back in the United States, per Kulach. Globally, it was still going strong, but there weren’t enough rides to go around for all the winners, particularly in North America. 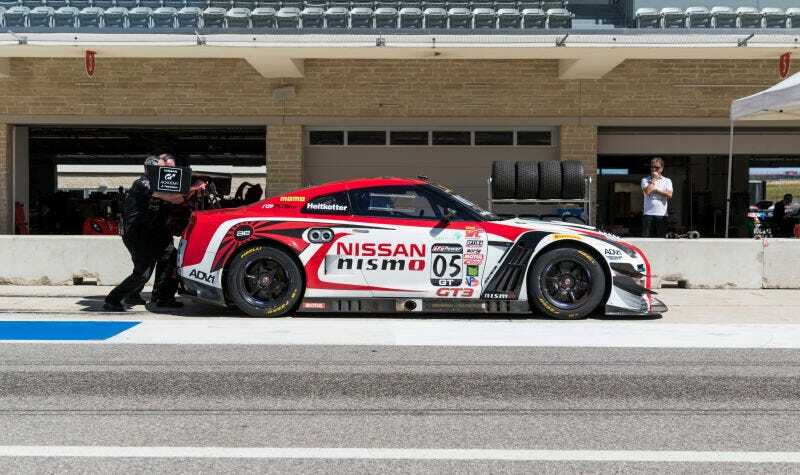 Thus, Nissan’s most visible factory-supported racing program in the United States last year became Always Evolving’s two-car Nissan GT-R Nismo GT3 program, which ran in Pirelli World Challenge’s GT class with factory support. The same fate that befell the LMP1 team—a lengthy period of little news before program’s ultimate cancellation—is eerily similar to what’s happened with Always Evolving in the offseason. Despite Always Evolving’s third-place finish in the teams’ championship for 2016, there has been no official announcement made yet as to Always Evolving’s plans for 2017. Two brand new 2017 GT-R Nismo GT3s had already been ordered for the team, however, Always Evolving Team Manager Ian Willis told Sportscar365 in December that the team wasn’t sure that Nissan would continue their factory support for the team. Willis told Sportscar365 that Always Evolving would like to stay in PWC if possible, and the Nissan employee’s comments seen by Jalopnik indicate that Always Evolving will likely stick around as a full-season customer team. However, Always Evolving already sold their two cars from 2016 to an Australian team to make room for the 2017 cars, notes Sportscar365. When Jalopnik asked Nissan directly for comment on their 2017 plans, a company representative confirmed that no decisions regarding this year’s North American motorsport plans would be made until February 17. At this point in PWC’s offseason, we’re already hearing teams announce their 2017 driver line-ups. The season starts on March 10 in St. Petersburg, Florida. Jalopnik also reached out to Always Evolving for comment, but never received a response. Globally, Nissan’s motorsport efforts are still going strong, with GT Academy, Super GT, and numerous GT3 and customer programs alive and well. If there’s a big motorsport event abroad with iffy international broadcast coverage, Nissan’s often the one to put together an English-language stream for it. Yet North America seems to be a no-man’s land when it comes to major factory Nissan racing support. And thus, we’re left confused. With the loss of Always Evolving’s factory support, we’re not sure what Nissan’s focus is anymore. In the past two years, Nissan’s star factory racing program here went from being its global Le Mans prototype in 2015 to a production-based GT-R in 2016. Now Nissan’s two biggest North American programs will be a customer GT-R team and the IMSA prototype of Tequila Patrón ESM, which Sportscar365 believes to be a mostly self-funded effort by the team with little financial backing from Nissan themselves. With Nissan’s focus changing year-to-year and an apparent lack of willingness to spend much of their own money on anything motorsport-related, it can be hard to tell if anything they’re doing works. Worse, Nissan North America’s slow and awkward withdrawal from being a major player in North American motorsports speaks to a dread every racing fan has: racing must make itself relevant to the masses to survive. We may be convinced that a car is cool because we see it on track, but more of us are in the market for a ran-when-parked 1987 BMW E30 than a new Altima. As for the people here in America who might actually buy a new Altima, I don’t know if any of them will ever care about any motorsports program at all. That’s the challenge, and with driver aids and autonomous technology making “fun to drive” less of a selling point, it’s only going to get harder from here. It’s far too easy for manufacturers like Nissan—whose bottom line is more connected to Rogue sales than race results—to walk away, which they tend to do quietly and abruptly, if recent history still rings true. Racing is expensive, and relies on sponsorship and manufacturer involvement to keep going. The question now is if anyone at Nissan even cares enough about racing to continue to support it here.